When You’re Being Challenged, Just Stew in Gratitude. The past twenty-four hours I’ve been extremely challenged. I’m not going to share in what way, as it’s very personal. I don’t always hold things in, and I am more than willing to share some personal things publicly, but for right now I’m not. And that’s okay. As it is for you when you don’t feel like talking about things. It’s good to get things off of our chest but only do it when you’re ready. But that’s not what I’m writing about today. What inspired me to write today is really about what is getting me through these challenging moments. When ever I’ve stumbled upon the rocky road of challenge, unintentionally of course, what seems to work for me is to do what I can to remind myself what it is that I am grateful for. I consider it a brain exercise to shake me from that which seems to be the norm, even though for the most part I see myself as a positive person. As you might too. Alas, I’m human. And I have a brain that has a file cabinet full of old memories, emotions, interpretations, limiting beliefs and old conversations about life and myself. I know you know what file cabinet I’m talking about. That one that when things seem bleak or well…challenging, it has no problem playing back those old recordings. Like old tapes that can be found in a basement in an old taped up box. But somehow those tapes find themselves in your CD player and you wonder how they ended up there. So although I’ve been frustrated, and was talking to myself while shedding a few tears in my car last night (okay that was personal), I engaged myself in the exercise of gratitude. What helped me get in this mode was watching TED video after TED video, reading a little bit of Napoleon Hill’s “Think and Grow Rich”, and watched a Bob Proctor video on “Decisions” this morning. That may seem like a lot, but trust me, I’m being really challenged right now. I know you’ve heard about the importance of being grateful but it’s only when you actually go down that path, as if you’re taking a walk together, can you really enter that state. 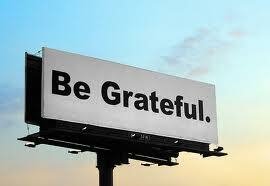 So, I’m going to get a little more personal with you and share what it is that I’m grateful for in this moment. And maybe, just maybe…this will inspire you too to take a moment and really reflect on what you appreciate about your life. For example…I’m grateful for the fact that my computer works great and is light enough that I can travel with it. That I can use it to gather my thoughts, send emails to friends and clients, and that I can watch TED videos to help me get in a better mood. I’m grateful for a car, regardless of how dirty it is right now, that is comfortable to drive, has GPS to tell me where I need to go even though I’ve probably driven that route multiple times, and is big enough to fit everything in it that I need. I’m grateful that I am my own boss. That I can make my own schedule, and can use my time how I want to. I am grateful that I get challenged by this very thing to utilize my time wisely as I could easily waste hours browsing into other peoples’ personal lives on Facebook. I’m grateful that I have amazing friends that are understanding, encouraging, and appreciative of what we are able to bring to each other’s lives. Even though sometimes I can be a complete introvert and turn inward, those same friends are there for me when I am ready to peek my head outside again. I’m grateful for my clients who after a session say thank you over and over, and express how much they are enjoying what they are learning. Yes it gives me purpose, yes it’s nice to be complimented but overall, it’s a reminder that I am on the right path and I get to live out my purpose in being here in this life time on the planet right now. I’m grateful for my younger sister who has been so helpful to me on so many levels. In my own personal evolvement, relating to family, and dog sitting my faithful companion while I am out of town or conducting a workshop. I am grateful for the many kids I come across – for their free smiles, their curious gazes and looks of wonder about this vast place called the world. I am grateful for the ability to have clean drinking water, and to heat up a teakettle to sip a cup of tea to comfort me while I do my work. I am appreciative of the technology that flies me across the sky, to be able to travel to distant places that would take me days to drive to in a car so I can experience them for the first time. And most of all I am grateful for the beast that is by my side, who reminds me to be playful, who likes to chase her tail for fun, and leans against my leg or lays on my foot, as she slowly melts into the floor to take a nap. I could go on and on, but I’m already feeling better. I try to remind myself to do this every night before I go to bed so I can complete my day in a feel good way, but sometimes I forget or am just too tired, and before I know it, I’m already on my way to an imaginative dream state that I will mostly forget and every once in a while remember. Until the next time I am challenged, I know I can always resort back to being conscious about the many things I can be, and AM grateful for. It can be painful and challenging to be human, but we can choose to remind ourselves that it’s nice to be alive too.